When granite countertops first made an appearance in Toronto in the late 1980s, it was mainly available in two colours. Most people were unaware of this new naturally occurring stone that was quickly replacing formica countertops in homes around the world. As the popularity of the stone surged in the decades to follow, newer patterns, colours and textures were introduced. Today, granite is available in as many as 15 different colours, many of which are previously unseen. While muted tones are a timeless choice, much can be achieved by playing around with colourful granite in other areas of the home. While there’s nothing novel about black granite, Agatha black with its endless waves and patterns makes for an elegant addition to your kitchen décor. 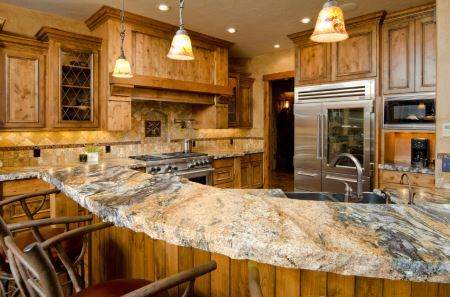 Originating in Brazil, it is one of the most sought after granite for kitchen countertops. Owing to the black and white colours in the stone, it blends seamlessly with an array of materials including natural wood, stainless steel, enamel or porcelain. With a polished finish, you can use it in your bathroom or even outdoors. The second most popular Granite in the world, Blue Bahia or Azul Bahia is a visually stunning stone with exclusive clusters in white and gold. Most blue granites are mined in coastal Africa. The bright colours with the amazing waves, patterns and clusters make this a wonderful choice for the bar table top, the bathroom and even the fireplace surround. Pair it with white cabinets and you can draw inspiration from the kitchens of the coast. Blue Bahia can also be mixed with other granites to create a colourful but inviting bathroom space. Contrary to what most people think, White Granite can be used to create a beautiful focal point. When you use Roma Imperiale, it adds the vividness and drama that is much needed of a focal point. With a soft muted off-white background featuring crisscrossing gold veining, it is an ideal choice for backsplashes, fountains, window sills, pool capping and countertops. This multi coloured stone originates in Brazil and is one of the most versatile choices for internal and outdoor applications. The striated patterns blends easily with any décor scheme. Add it to the bath and it will complement the golden bath fixtures perfectly. Green granite can be added to any part of the home without making it seem out-of-place. But its perfectly suited for baths due to the calm and relaxing vibe it exudes. The Caribbean Green granite will instantly transform your bathroom into the Caribbean tropics with its calm blue waves and striations in blue, green and beige. This is a wonderful choice for backsplashes, bathroom flooring, countertops and even shower walls. Irrespective of which colour you choose for your home in Toronto, you will love the ease-of-use and minimal maintenance that comes with it. With the many colour choices, it allows you to expand the use of this resilient stone to other areas of the home.